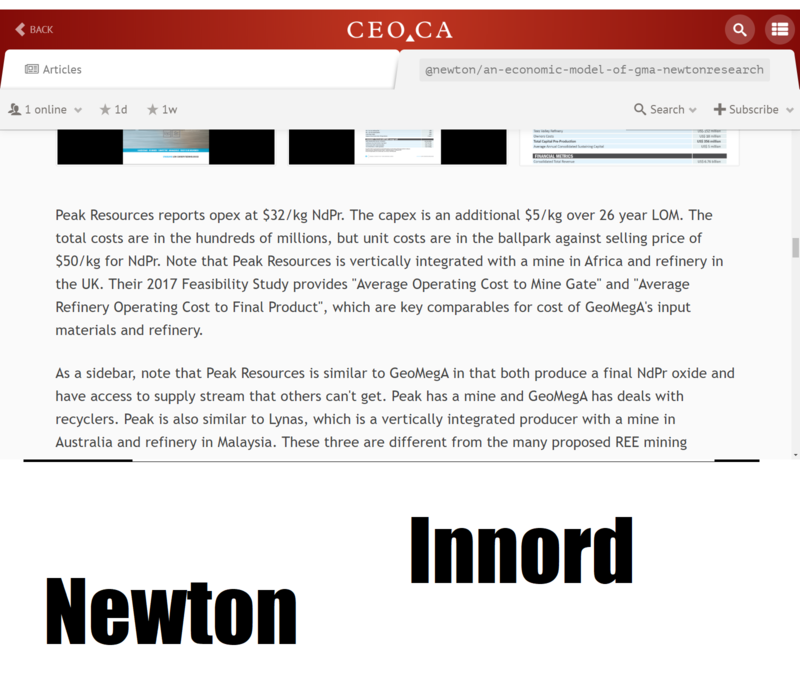 Back on March 21st 2019, I published an article ( https://ceo.ca/@newton/an-economic-model-of-gma-newtonresearch ) looking around the corner at economics for GéoMégA Resources (TSXV:GMA). Then, the company published initial guidance in a news release dated April 3rd. How did the numbers compare? Long story short, GMA beat my estimates with better revenue, margins, and capex figures. One negative surprise I encountered was how much they're paying for the magnet waste to recyclers. That may change. The biggest surprise was the cost of GMA's ISR technology, which was way below my expectations. Find more in a data room I'm working on here ( https://drive.google.com/drive/folders/1YtuARNHvFv0KW3tpB6ylB-4Pd26PfdGy ). And read on for a detailed breakdown of all these figures. Before we get into that, note that it's somewhat surprising GMA provided any guidance on the economics of Innord's new rare earth recycling business. They didn't release a Feasibility Study or anything that you might expect from a "junior mining company". Why? Well, "The demonstration plant will process feed material exclusively sourced from arms length third party sources which are not considered a mineral as contemplated by NI 43-101." Respect to GMA for finding a way forward with this new business line! Read on for more about the highest price and highest demand rare earths out there today, neodymium, praseodymium, dysprosium, and terbium. 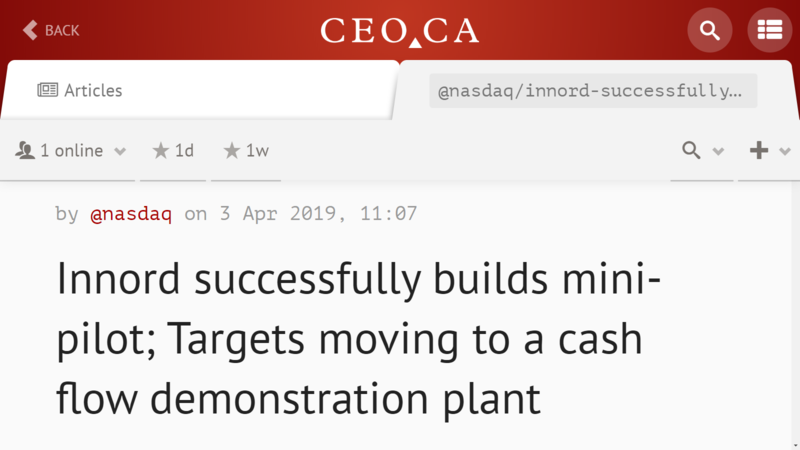 As Kiril refered to them at PDAC 2019, the "HHREE" (https://ceo.ca/@newton/kiril-mugerman-gma-at-pdac2019). 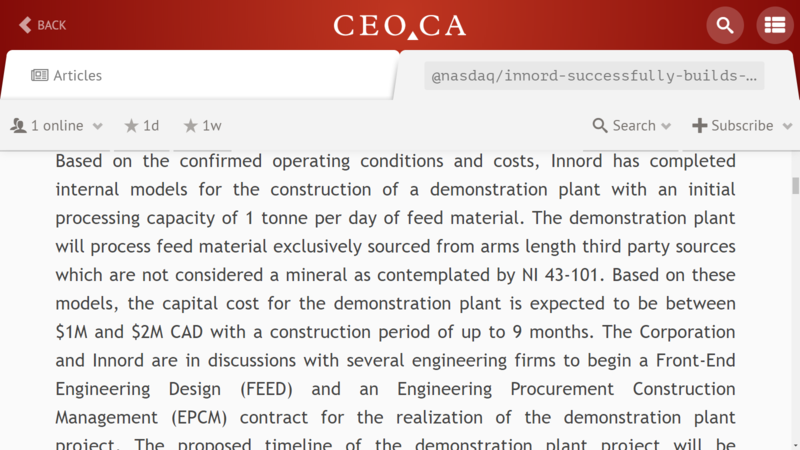 "Based on the confirmed operating conditions and costs, Innord has completed internal models for the construction of a demonstration plant with an initial processing capacity of 1 tonne per day of feed material... Based on these models, the capital cost for the demonstration plant is expected to be between $1M and $2M CAD with a construction period of up to 9 months... Based on today’s market pricing, this could potentially generate over $6M in revenues. Due to the flexible design of the ISR Technology, the Corporation and Innord estimate that with minimal additional capital expenditures, the demonstration plant could then be revamped to process over 1.5 tpd... 1.5 tpd operation, which is the base model envisioned by Innord, the recycling operation could produce over $10M (based on today's pricing) annually in revenues with 24% profit margins (considering cost of feed that the company is expecting based on ongoing discussions with potential suppliers and LOI already signed, operating costs and transportation quotes received by Innord). Capital payback on the project is estimated by management to be 1 to 2 years." 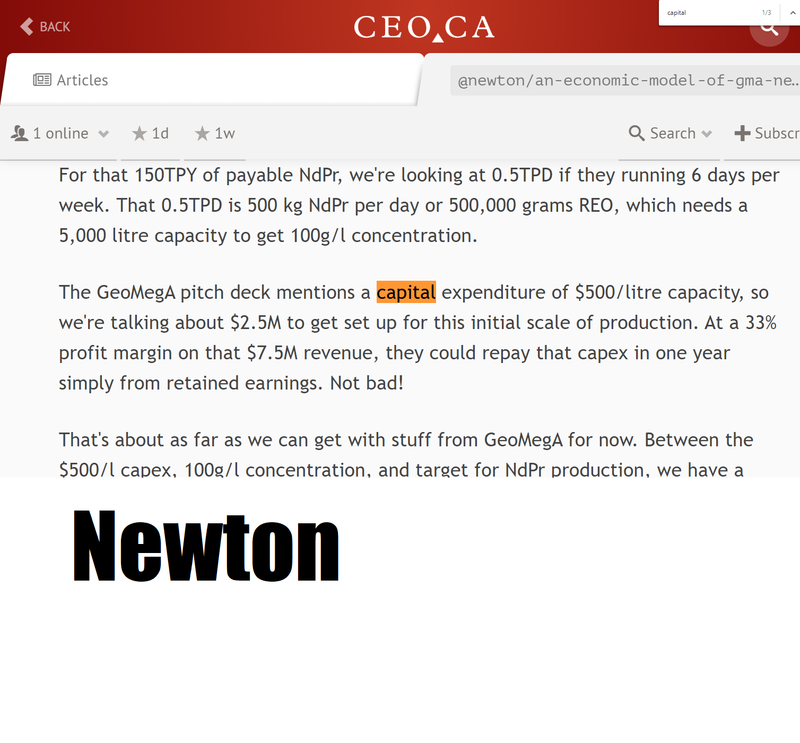 See some screenshots from my Newton Research and quotes below (https://ceo.ca/@newton/an-economic-model-of-gma-newtonresearch). "The GeoMegA pitch deck has some key info on what to expect, but it takes a few calculations to see what's what. For the initial stage, they are talking about producing +150 tonnes per year of NdPr from 500TPY magnet waste feed with 30-40% NdPr by weight. At current prices around $50/kg NdPr, this is $7.5M revenue per year. Revenue! Imagine that... For that 150TPY of payable NdPr, we're looking at 0.5TPD if they running 6 days per week. 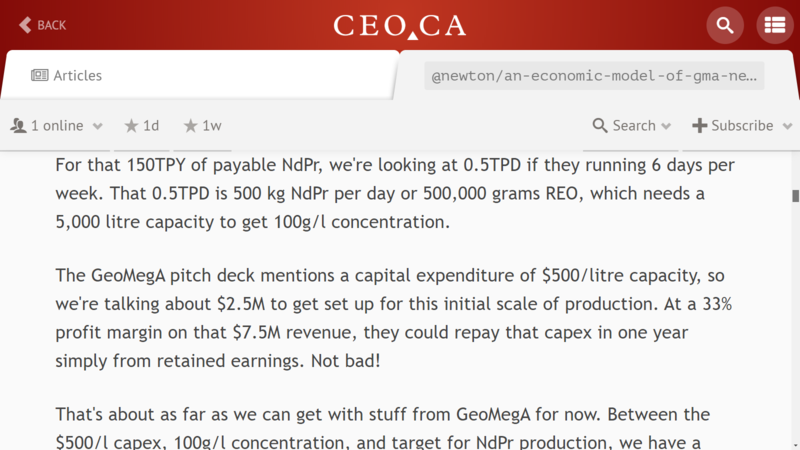 That 0.5TPD is 500 kg NdPr per day or 500,000 grams REO, which needs a 5,000 litre capacity to get 100g/l concentration. The GeoMegA pitch deck mentions a capital expenditure of $500/litre capacity, so we're talking about $2.5M to get set up for this initial scale of production. At a 33% profit margin on that $7.5M revenue, they could repay that capex in one year simply from retained earnings. Not bad! 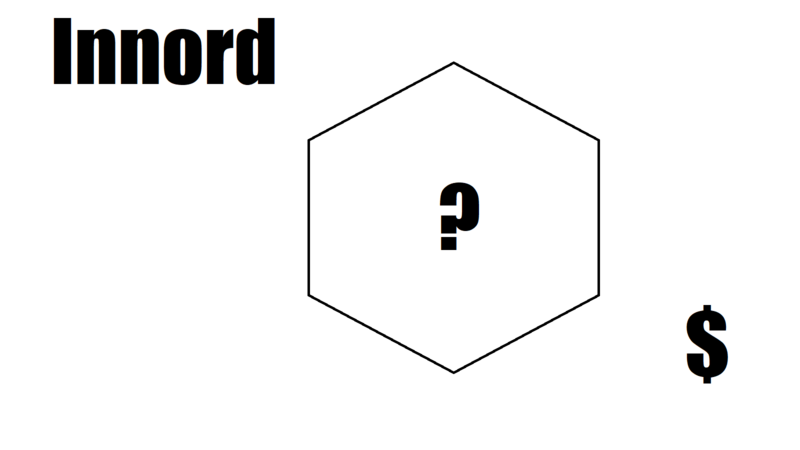 That's about as far as we can get with stuff from GeoMegA for now. Between the $500/l capex, 100g/l concentration, and target for NdPr production, we have a sense for top-line revenue and capex." Now, it's time to compare! First up, I wrote about a $2.5M capex, but GMA guidance says $1-2M. Where did that difference come from? 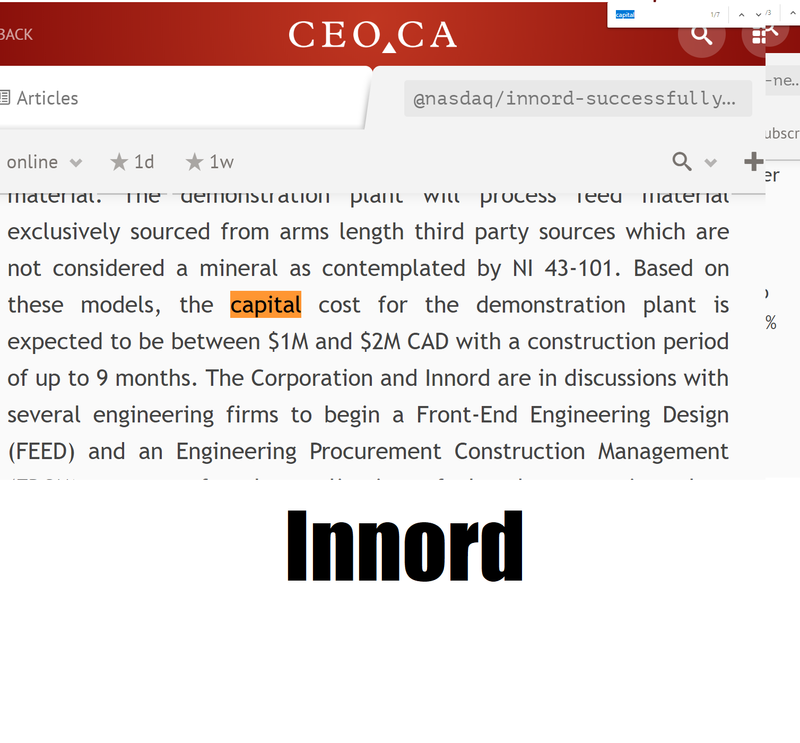 Well, GMA says "Innord has completed internal models for the construction of a demonstration plant with an initial processing capacity of 1 tonne per day of feed material... capital cost for the demonstration plant is expected to be between $1M and $2M CAD... demonstration plant could then be revamped to process over 1.5 tpd." My calculations had 500TPY magnet waste feed, containing 30% NdPr. That 500TPY is 1.5TPD of feed material. If we repeat my calculations with 300TPY feed for 1TPD instead, then we have 0.3TPD NdPr or 300,000 grams NdPr that requires 3,000 litres processing capacity. At $500/l capex, that would be $1.5M capex -- right in the middle of GMA's $1-2M guidance. Can we confirm that the new capex guidance from GMA fits with my previous calculations? Yes. The difference in capex figures is due to the fact that GMA is talking about modifying a 1TPD plant to take 1.5TPD for minimum cost, rather than building a 1.5TPD plant. In the news release, they write "Due to the flexible design of the ISR Technology, the Corporation and Innord estimate that with minimal additional capital expenditures, the demonstration plant could then be revamped to process over 1.5 TPD." In contrast, I simply assumed they would build a 1.5TPD plant. Hence, my over-estimate for initial capex. This is a subtle wrinkle I didn't expect. I'm not mad at GMA for this one! I expect GMA to finds ways to do things intelligently and a low-cost upsize from 1TPD to 1.5TPD capacity is a great example of that. I suspect we may see more of that kind of growth from Innord going forward. As GMA says, "The operation could then be easily increased to process larger amounts of feed to accommodate the continuous growth in large rare earth magnet applications such as wind power and transport electrification." Easier said than done! My guess was as follows, "For the initial stage, they are talking about producing +150 tonnes per year of NdPr from 500TPY magnet waste feed with 30-40% NdPr by weight. At current prices around $50/kg NdPr, this is $7.5M revenue per year. Revenue! Imagine that." That's the 1.5TPD "Base Case" from GMA. For comparison, GMA's guidance has a couple numbers to consider. The GMA news mentions a 1TPD production case, where "Based on today’s market pricing, this could potentially generate over $6M in revenues." This is the Demonstration Plant referred to in the headline of the GMA news release. It's the same plant that can be revamped to process 1.5TPD for "minimal additional capital expenditures". The 1.5TPD production scenario is the main attraction -- the Base Case, as they call it. In the Base Case, GMA earns $10.2M in Sales. The 1.5TPD translates into 500TPY input capacity. 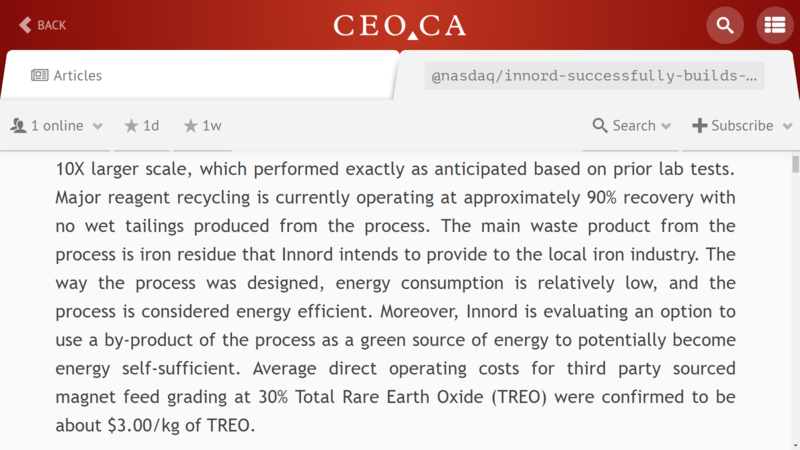 With 30% TREO (Nd, Pr, Dy, Tb), they're talking about producing 150 tons per year of their mixed rare earths basket. For $10M revenue, their implied basket price is like $66/kg. Note that my basket price was different -- I used $50/kg NdPr output. GMA is using $66/kg TREO. The difference is due to the presence of Dy and Tb, which have higher prices than Nd and Pr. The difference is large and deserves close consideration going forward. The fact that GMA is including Dy and Tb implies some assumptions about their ability to find buyers, which are probably reasonable based on the small scale of the Base Case. Marketability may provide a limiting factor in models predicting economics in large growth scenarios for GMA. I had guessed GMA revenues would be $7.5M per year in the base case, but they beat my estimate at +$10M. There are lots of costs to consider. The basic one from GMA is "Cost of Goods Sold" at $7.4M for 150TPY TREO. That's nearly $50/kg cost of production. If the GMA rare earth basket was just NdPr, then we'd have a problem. However, as detailed above, the GMA basket includes higher value REE like Dy and Tb. With that, you can see how important those other REE are to the GMA economics at this point. Note, GMA also provides an estimate for $0.3M of "Cost of Sales". Call it $2/kg overhead costs and add it to the pile. What about other key parts of the GMA economics? Let's turn to some comparables. The Peak Resources (ASX:PEK) 2017 BFS proposes a vertically-integrated project that goes from mine to mixed concentrate to rare earth oxide. They estimate total pre-production capex at +$350M, which translates to $5/kg NdPr over 26 year the life of money. All that compares favourbaly to GMA at $1.5M total initial capital cost, but these are very different projects with GMA completing product lifecycles. They have different strategic positions, but both compete in REE markets so it's worthwhile to compare their cost structures. I wrote, "Peak Resources reports opex at $32/kg NdPr... The Peak Resources 2017 BFS puts 55% of opex to get the mixed con "to the mine gate", which is $18.81/kg NdPr eq." For rough numbers, I'd put cost of mining for Peak at approximately $20/kg and refining $12/kg. If we load capital costs simply, then it raises refining costs to $15/kg. It's possible to get more accurate number with more detail on which parts of capex apply where, but I proceed simply for now. There are two simple ways to compare Peak and GMA. 1, Is the cost of producing mixed con similar to buying recycling waste? 2, Is the cost of Peak's SX similar to GMA's ISR? GMA writes, "The way the process was designed, energy consumption is relatively low, and the process is considered energy efficient. Moreover, Innord is evaluating an option to use a by-product of the process as a green source of energy to potentially become energy self-sufficient. Average direct operating costs for third party sourced magnet feed grading at 30% Total Rare Earth Oxide (TREO) were confirmed to be about $3.00/kg of TREO." Is it really fair to say the ISR costs are $3/kg TREO, whereas Peak SX costs are $12/kg NdPr?! The baskets are slightly different because Peak is just considering NdPR, but I am stunned to hear that GMA's ISR tech could already be that much cheaper? 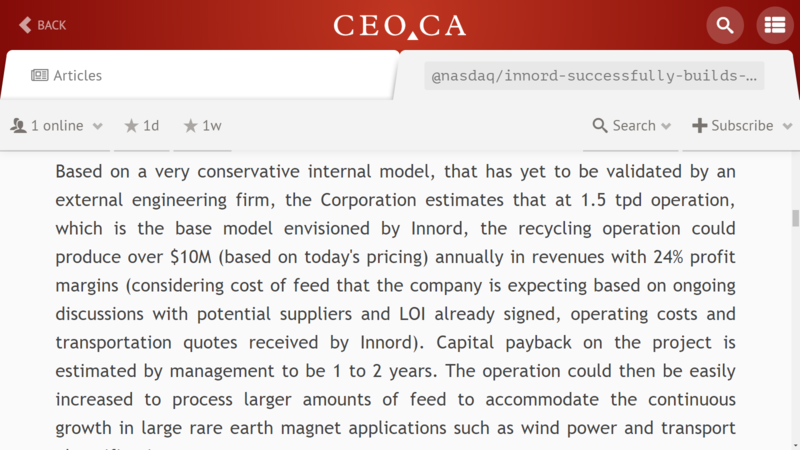 And ISR has the potential to become even cheaper, as "Innord is evaluating an option to use a by-product of the process as a green source of energy to potentially become energy self-sufficient." Imagine that! It's hard to explain how GMA might come in with comparable costs one quarter of competitors as I don't know what ISR does. GMA doesn't provide a breakdown of costs beyond the $3/kg TREO number in the news. I will watch for more news there, but expect little information. If the costs really are so low, then this likely going to be a closely guarded secret. It will give some investors pause to see that biggest cost advantage (edge?) could also be the most opaque part of business for GMA. 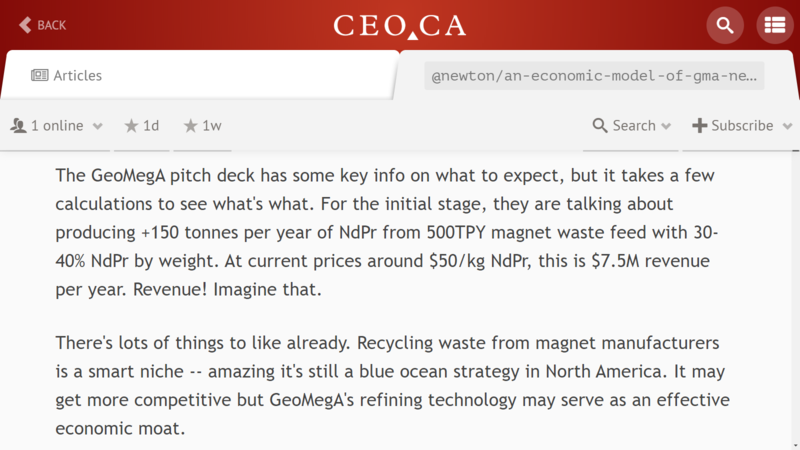 I wrote, "If GeoMegA spends the same amount as Peak on refining, then GeoMegA will spend $4.62/kg feed to refine magnet waste into final product." I got that four dollar cost number by taking 30% of $15.39/kg NdPr, which is 45% of the capex-loaded cost number $38/kg NdPr equivalent. Sorry if that's as clear as mud, but I mention it to repeat that my expected refining costs were $12/kg NdPr on operating basis from Peak. $15/kg if you add capital costs. Either way, I was very surprised by GMA $3/kg TREO number. Can we proceed to estimate the cost of feed for GMA? They talk about COGS $7.4M for 1.5TPD Base Case. This is 500TPY input with 30% TREO, which gives 150TPY TREO with effective total costs of $50/kg TREO. 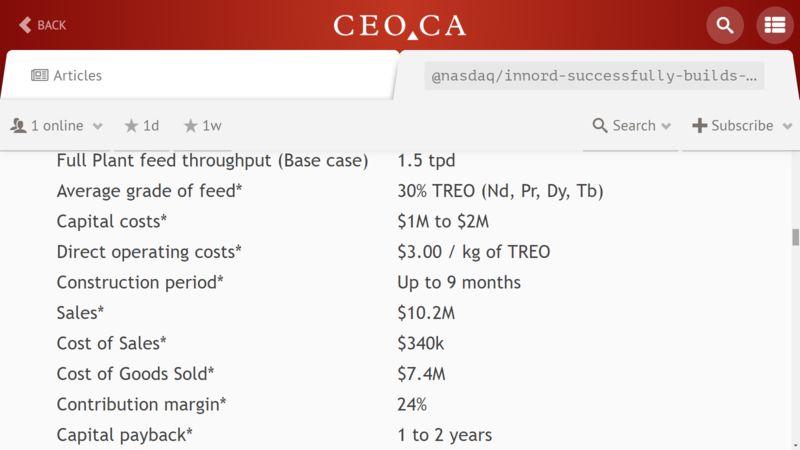 With "Direct operating costs" of $3/kg TREO, the cost of feedstock is $47/kg. Almost 95% of COGS is cost of buying magnet waste from recyclers? I wrote, "If it's competitive, then GeoMegA can afford to pay a similar amount for feedstock as it costs Peak Resources to mine the mixed con! The Peak Resources 2017 BFS puts 55% of opex to get the mixed con "to the mine gate", which is $18.81/kg NdPr eq." I was expecting 55% of COGS to be buying recycling material, not +90%. I am surprised to see the magnet waste cost so much, but the flipside means the ISR is relatively cheaper than expected. It also means there is great benefit from sourcing cheaper recycling feed. How much magnet waste is there in the world that GMA could source at $0 cost, for example? Are there magnet manufacturers who could provide a few hundred tonnes of magnet waste to Innord simply for "security of supply" from recycling their own waste? It's an off the wall idea, but I wanted to mention it. In my research, I wrote about an important cost statistic -- how much is GMA paying for their input material? I wrote, "In passing, note how that's like 35% of the NdPr price per kg. Well below the 65% rule of thumb in China mentioned above, but above the 15% payable to monazite suppliers -- it certainly leaves room for GeoMegA to achieve some good profit margins." What is the cost of the TREO contained in GMA recycling feed? 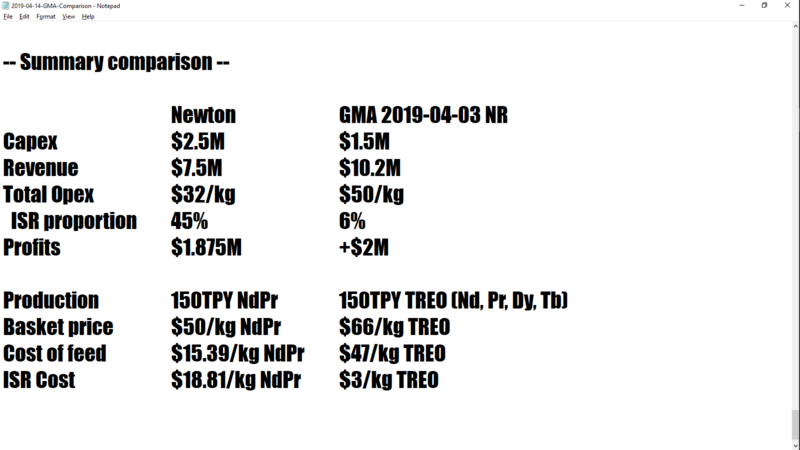 With GMA facing cost of feed at $47/kg TREO and a basket price of $66/kg, they are paying approximately 70% of the cost of the contained TREO to the magnet waste provider. Sounds conservative relative to the 65% rule of thumb mentioned elsewhere, but not unrealistic. Good as a Base Case! Again, GMA mentions "Sales Costs" at $0.3M for 150,000kg TREO production. Call it $2/kg for an important part of overhead costs. It's fair to assume there are other relevant G&A costs to consider with the massive growth potential ahead of GMA. I don't have any estimates for those costs, but will mention that it is possible to grow too quickly. So far, GMA hasn't suffered from that problem. To conclude, please let me mention a few outstanding questions. One important thing that's unclear -- currencies. The GMA news specifies Canadian dollars once, but I generally assume we're working in US dollars. That may be misleading as this is a Canadian company operating in Canada. Another important topic is additional operational costs, like shipping and handling. Does GMA's cost of feed for $47/kg TREO refer to material delivered to GMA site or are there additional costs that we haven't seen yet? Also, I would like to compare to Lynas but don't have a good sense for the breakdown of their costs. Note also that I didn't report the payback period in my first piece. I did write, "With the $7.5M revenue calculated initially and that 25% margin, GeoMegA could make $1.875M profit per year." And had initial capex at $2.5M, which puts payback at 1.3 years -- in the same ball park. +/- Positive & Negative Conclusions? Negative was GMA margin at 24% versus Peak estimate of approximately 36%. This is based on Peak's $32 cost per kg NdPr and $50 selling price, versus GMA's $10.2M sales and $7.4M COGS for 150TPY TREO production. Mixed negative was cost of feed stock at $47/kg TREO and 70% of contained metal value. Somewhat unclear if that is a negative -- it may be a conservative initial number to anchor expectations and allow GMA to beat estimates. Also may be possible to find cheaper feedstock. Mixed positive was GMA basket price of $66/kg TREO. It's good to have high value output like Dy and Tb, but without them the GMA economics appears to be marginal. If it was just NdPr with a $50/kg basket price, then the $50/kg cost doesn't look good. Positive was the combination of capex coming in at $1-2M versus $2.5M predicted, revenue at $10.2M versus $7.5M, and direct costs for ISR at $3/kg TREO versus $12-15/kg predicted. I'm still wondering if I've got the units wrong on that, as it sounds like ISR is both the most technically innovative and financially rewarding part of the Innord business plan.